The SQL FOREIGN KEY CONSTRAINT is used to ensure the referential integrity of the data in one table to match values in another table. The FOREIGN KEY CONSTRAINT is a column or list of columns which points to the PRIMARY KEY of another table. The main purpose of FOREIGN KEY is, only those values will appear which are present in the primary key table. For each row in the referencing table( the table contains the FOREIGN KEY), the foreign key must match an existing primary key in the referenced table(the table contains the PRIMARY KEY). This enforcement of FOREIGN KEY called the Referential Integrity. 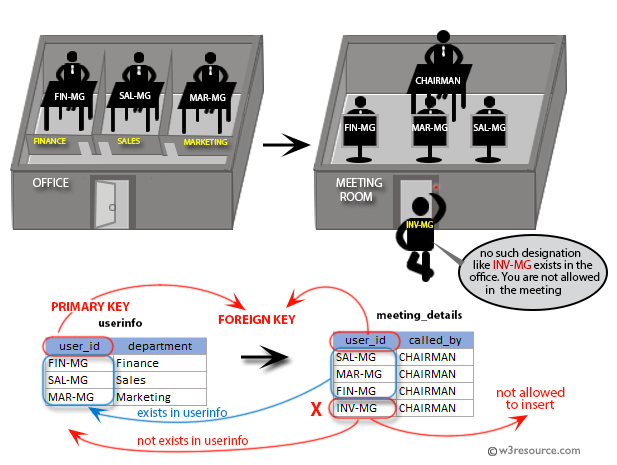 The structure and data type of PRIMARY KEY and FOREIGN KEY must be same. The values of the FOREIGN KEY columns in each row of the referencing table have to match with the values of the corresponding primary key columns of a row in the referenced table. table_name The name of the table where data is stored. constraint Is a key word. This key word is optional. constraint_name Is a constraint name defined by user. primary_key_table Table where primary key resides. column_list_of_primary_key_table List of columns which makes primary key for a table. Suppose, we have a table 'agents', that includes all agents data, and we are going to create another table named 'customer1', that includes all customers records. The columns and data types for both the tables have shown bellow. The constraint here is that all customers must be associated with an agent that is already in the 'agents' table. In this case, an SQL FOREIGN KEY CONSTRAINT should be created with the 'customer1' table which is related to the SQL PRIMARY KEY CONSTRAINT of the 'agents' table. Now, we can ensure that all customers in the 'customer1' table are related to an agent in the 'agents' table. In other words, the 'customer1' table can not contain information of any agent who is not on the 'agents' table. In the following topic, we are going to discuss the usage of FOREIGN KEY CONSTRAINT without using the 'foreign key' keyword. To create a table which contains the following field names and data types. The table contains a PRIMARY KEY CONSTRAINT on 'cust_code' and a FOREIGN KEY on 'agent_code' without using the FOREIGN KEY key word. The 'agent_code' in 'agents' table are unique. Only those 'agent_code' which are present in 'agents' table will appear in 'mytest' table because reference column is 'agent_code' of 'agents' table. In the following topic, we are going to discuss, how FOREIGN KEY CONSTRAINT can be used without specifying the primary key column(s). In the following topic, it is going to be discussed that, how SQL FOREIGN KEY CONSTRAINT is used with primary key column list in a CREATE TABLE statement. The table contains a PRIMARY KEY CONSTRAINT on 'cust_code' and a FOREIGN KEY on 'agent_code'. In the following topic, we are going to discuss, how SQL FOREIGN KEY CONSTRAINT can be used on more than one columns with primary key column list in a CREATE TABLE statement. The table contains a PRIMARY KEY CONSTRAINT on 'ord_num' and a FOREIGN KEY in a combination of 'cust_code' and 'agent_code' column. The 'cust_code' and 'agent_code' combination in 'customer1' table are unique. Only those 'cust_code' and 'agent_code' combination which are present in 'customer1' table will appear in 'mytest' table because reference columns are 'cust_code' and 'agent_code' combination of 'customer1' table. In the following topic, we are going to discuss, how SQL FOREIGN KEY CONSTRAINT can be used to refer its own table in a CREATE TABLE statement.